Everybody loves chips and salsa, but maybe it’s time to raise the bar — and do something a bit more grown-up for your next party. Not to worry — this doesn’t mean spending an entire day in the kitchen preparing your mother’s handmade raviolis. Instead, we suggest offering an assortment of artisan craft meats, cheeses, crackers, sweet and savory spreads and dried fruits — aka a charcuterie board or tray. Not only are charcuterie boards easy to prepare — they work for every season. Whether a spring brunch, a summer pool party, or the ever-busy winter holidays — they are ALWAYS a great option for entertaining. Calabrese is a zesty salame made with red bell peppers. Enjoy it with a hard cheese like Parmigiano Reggiano. Wash it down with an IPA or a syrah. Genoa is a mild salame seasoned with wine and garlic. Add a softer cheese, like fontina or fresh goat cheese for a different texture. They go well with a chilled sauvignon blanc or Pilsner. Italian Dry is our San Francisco classic salame that pairs well with a hard sheep-milk cheese like pecorino romano. This combination works well with Pinot Noirs, Pilsners and Pale Ales. 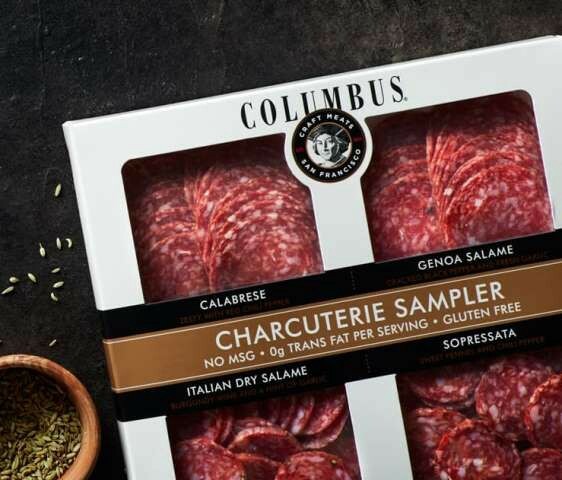 Sopressata brings flavors of sweet fennel and chili pepper. Combine with a harder cow cheese like Grana Padano. Savor it with a glass of pinot grigio. You can also include other delicious cured meats like prosciutto or coppa to your board. Crunchy breads and crackers: These should be plain so as not to compete for the many flavors on the board. Favorites: Toasted plain baguette, pita bread, water crackers and bread sticks. Spreads: Both creamy and seeded mustard versions are good choices. Sweet and savory jams with caramelized onion flavors or deep fruity notes are also welcome partners. Just be sure to select flavors that aren’t too overwhelming. Favorites: Fruit chutney, fig jam, hummus or a white bean dip. Olives and pickled vegetables: Always great additions. Cornichons and pickled radishes work very well. Fresh seasonal fruits: are welcome too. In the winter dried fruits including apricots and figs add to the flavors of the meat and cheeses. That’s it! Just start with the best craft meats, include complementary cheese, breads and spreads that provide different textures and flavors, pop open bottles of wine and beer, and enjoy the gathering. Make sure you invite us to your next party!